Good Luck To All The Lads - ubiq bookshop: the best place to buy books! Good luck to all the lads. Brian Cox wrote those words in his diary on 26 August 1940, just before he and his mates from 9 Platoon of 27 (Machine Gun) Battalion experience enemy action for the first time in the Western Desert. Good Luck To All The Lads is the story of Brian Cox and his schoolmates from Nelson College and of 9 Platoon during the Second World War. 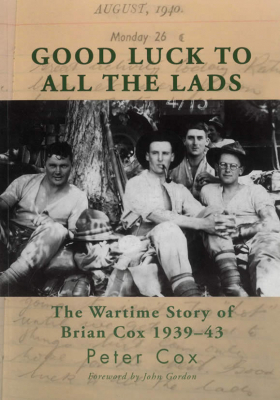 This moving and fascinating book written by Brian's son Peter Cox, covers the men's time training in New Zealand and Egypt, the action they saw in Greece, Libya and the Western Desert. It is a memorial to the young men, many of them from Nelson College, who bravely served, and sometimes died, so far from home.